The word cactus usually produces images of the desert—such as the saguaro cactus of Arizona with it’s “arms” in the air. In contrast, the Christmas cactus is part of the Zygocacti family and it is a tropical plant that requires very different care than other cacti. They are popular as a gift plant, and they make excellent house plants when given good air circulation and plenty of bright light (but not direct sun). 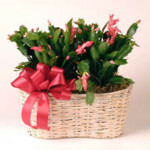 Christmas cactus comes in many colors, including red, hot pink, peach and white. Water and humidity are very important to this plant, but it’s important to not over water. When the top of the soil surface feels dry give it enough water so that cactus is evenly moist but not wet or soggy. When the soil dries out on top (not all the way down), water thoroughly. 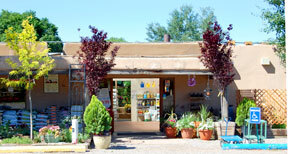 Remember clay pots dry out faster, so the plant may need watering more often. Place the pot over a tray of pebbles filled with water; this will raise the humidity around the plant (top up the water in the tray as it evaporates). Fertilize every other week with a high-phosphorus (the middle number on the fertilizer label) bloom food, diluted to ½ its recommended strength. 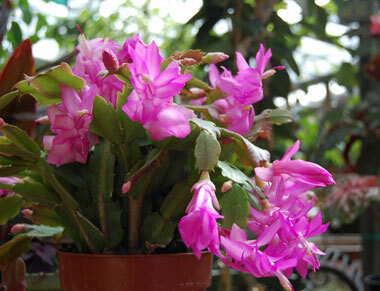 Christmas cactus are strong, easy to grow and can thrive for many years. In mild weather they can be kept outside in light shade or very filtered sunlight. They cannot tolerate frost, so be sure to bring them inside before it freezes in the fall. There is a “trick” to getting them to bloom again each holiday season. At the nursery we “fool” the cactus into “going to sleep” for 6 to 8 weeks before the holiday season. While the plant is dormant, it focuses all its energies into creating new buds which bring flowers. Drought: Cut back on watering. 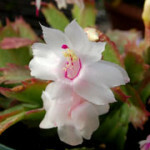 In late October or very early November, begin watering the cactus only when the top 1 inch of soil is dry to the touch. The goal is to keep the rootball just slightly moist. Coolness: To trigger bud formation, Christmas cacti need to be cool—on average between 50 and 55ºF for best results. The cooler they “sleep” it, the better they bloom. As soon as buds appear bring the cactus into a sunny, warm (60-70ºF) area—no direct sunlight. Be aware of cold drafts—they can cause bud-drop. 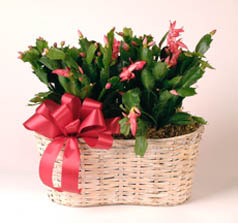 Potbound Christmas cactuses bloom better, but if the plant’s roots are bursting from their pot, repot the cactus to one pot size larger and use a porous soil. 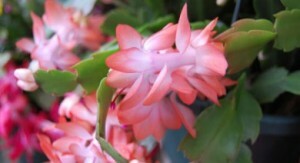 Distinguishing Characteristics: Christmas cactus are strong, easy to grow and can thrive for many years. In mild weather they can be kept outside in light shade or very filtered sunlight. They cannot tolerate frost, so be sure to bring them inside before it freezes in the fall.